1 A None No Power Seat 1 A is a standard First Class seat however, the proximity to the lavatory and galleys may be bothersome. 1 D None No Power Seat 1 D is a standard First Class seat however, the proximity to the lavatory and galleys may be bothersome. 1 F None No Power Seat 1 F is a standard First Class seat however, the proximity to the lavatory and galleys may be bothersome. 11 A None No Power Seat 11 A is a standard Economy seat that may have limited recline due to the exit row behind. 11 C None No Power Seat 11 C is a standard Economy seat that may have limited recline due to the exit row behind. 11 D None No Power Seat 11 D is a standard Economy seat that may have limited recline due to the exit row behind. 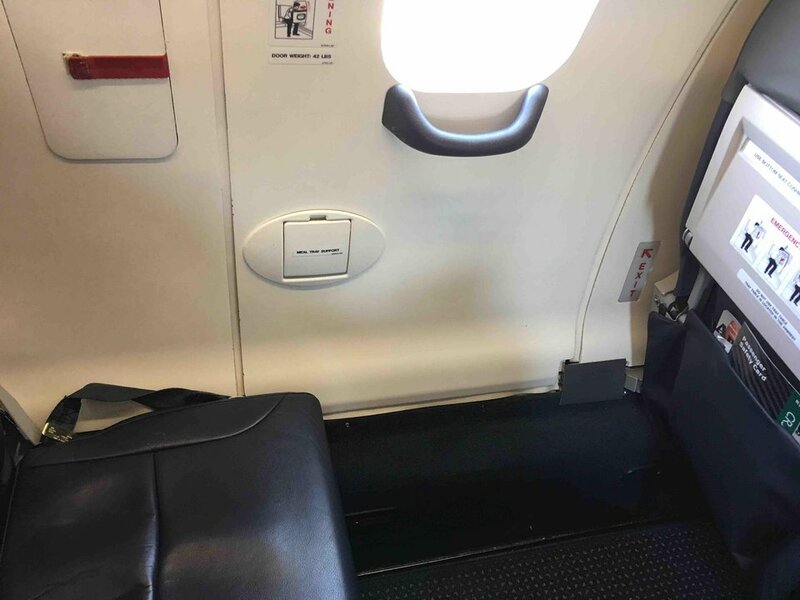 11 F None No Power Seat 11 F is a standard Economy seat that may have limited recline due to the exit row behind. 12 A None No Power Seat 12 A is a standard Main Cabin Extra seat that has extra legroom due to the exit in front however, may also have limited recline due to the exit row behind. 12 C None No Power Seat 12 C is a standard Main Cabin Extra seat that has extra legroom due to the exit in front however, may also have limited recline due to the exit row behind. 12 D None No Power Seat 12 D is a standard Main Cabin Extra seat that has extra legroom due to the exit in front however, may also have limited recline due to the exit row behind. 12 F None No Power Seat 12 F is a standard Main Cabin Extra seat that has extra legroom due to the exit in front however, may also have limited recline due to the exit row behind. 13 A None No Power Seat 13 A is a standard Main Cabin Extra seat that has extra legroom due to the exit in front. 13 C None No Power Seat 13 C is a standard Main Cabin Extra seat that has extra legroom due to the exit in front. 13 D None No Power Seat 13 D is a standard Main Cabin Extra seat that has extra legroom due to the exit in front. 13 F None No Power Seat 13 F is a standard Main Cabin Extra seat that has extra legroom due to the exit in front. 19 C None No Power Seat 19 C is a standard Economy seat however, the proximity to the lavatory may be bothersome. 19 D None No Power Seat 19 D is a standard Economy seat however, the proximity to the lavatory may be bothersome. 20 A None No Power Seat 20 A is a standard Economy seat in the last row of the aircraft that may have limited recline. The proximity to the lavatory may be bothersome. 20 C None No Power Seat 20 C is a standard Economy seat in the last row of the aircraft that may have limited recline. The proximity to the lavatory may be bothersome. 20 D None No Power Seat 20 D is a standard Economy seat in the last row of the aircraft that may have limited recline. The proximity to the lavatory may be bothersome. 20 F None No Power Seat 20 F is a standard Economy seat in the last row of the aircraft that may have limited recline. The proximity to the lavatory may be bothersome. 4 A None No Power Seat 4 A is a standard Main Cabin Extra seat that has extra legroom due to the position of the bulkhead. 4 D None No Power Seat 4 D is a standard Main Cabin Extra seat that has extra legroom due to the position of the bulkhead. 4 F None No Power Seat 4 F is a standard Main Cabin Extra seat that has extra legroom due to the position of the bulkhead. 5 A None No Power Seat 5 A is a standard Main Cabin Extra seat. 5 C None No Power Seat 5 C is a standard Main Cabin Extra seat that has extra legroom due to the missing seat in front however, other flyers tend to bump into this seat. 5 D None No Power Seat 5 D is a standard Main Cabin Extra seat. 5 F None No Power Seat 5 F is a standard Main Cabin Extra seat. 6 A None No Power Seat 6 A is a standard Main Cabin Extra seat. 6 C None No Power Seat 6 C is a standard Main Cabin Extra seat. 6 D None No Power Seat 6 D is a standard Main Cabin Extra seat. 6 F None No Power Seat 6 F is a standard Main Cabin Extra seat. 7 A None No Power Seat 7 A is a standard Main Cabin Extra seat. 7 C None No Power Seat 7 C is a standard Main Cabin Extra seat. 7 D None No Power Seat 7 D is a standard Main Cabin Extra seat. 7 F None No Power Seat 7 F is a standard Main Cabin Extra seat. 8 A None No Power Seat 8 A is a standard Main Cabin Extra seat. 8 C None No Power Seat 8 C is a standard Main Cabin Extra seat. 8 D None No Power Seat 8 D is a standard Main Cabin Extra seat. 8 F None No Power Seat 8 F is a standard Main Cabin Extra seat. The CRJ-900 is a regional jet used on short-haul routes and is operated by Mesa Airlines on behalf of American Airlines. Onboard storage is limited and suitcases may need to be checked at the aircraft door to be picked-up upon arrival. There is no inflight entertainment onboard. Every other row on this aircraft has misaligned windows. Most of windows and seats are misaligned. 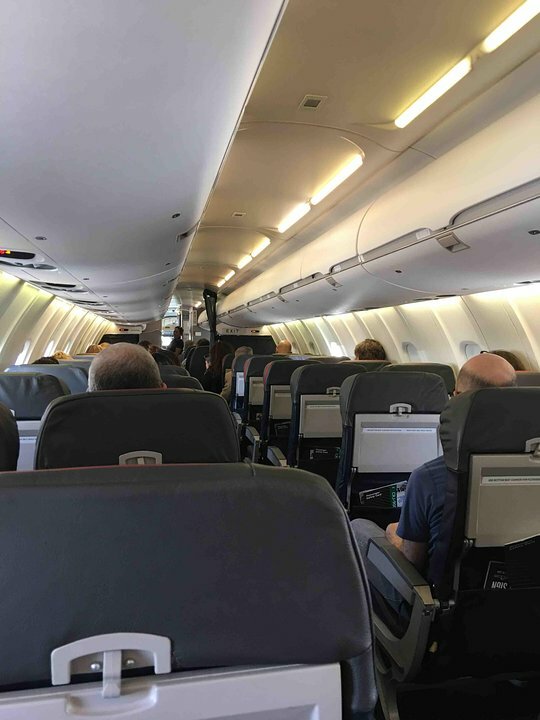 I asked the attendent why the majority of the seats don't have a full window and she said it was reconfigured to accommodate first class and main cabin extra. Good seat with plenty of legroom...I paid extra for MCE. 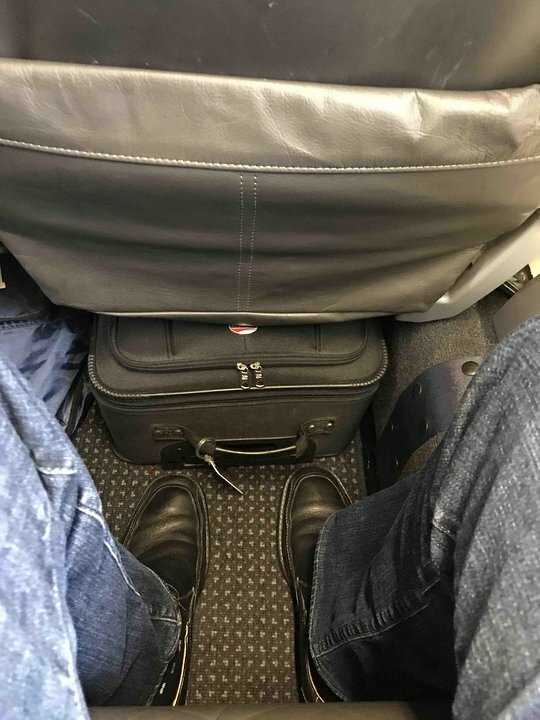 I am 6'4" and 260# and was comfortable in the seat for the hour or so flight from SGF to DFW. I agree with most comments about this plane being sub-par, American has to do something to put them to their standard, poor condition overall, bathroom not operative, worst is that you never know what version the actual plane will be, when I choose this seat it was not supposed to have a seat in front, but it did and the seat was not a Main Cabin Extra as advertised, I get these seats for free because of my status, but if I had paid extra for it I would be real mad. I fly this route often, I have chosen exit row that are not exit rows or wouldn't recline, seat bottoms very short. If I had a choice I wouldn't choose this plane. Current comment states that it may have limited recline. There is NO RECLINE and the seatback is close to vertical. 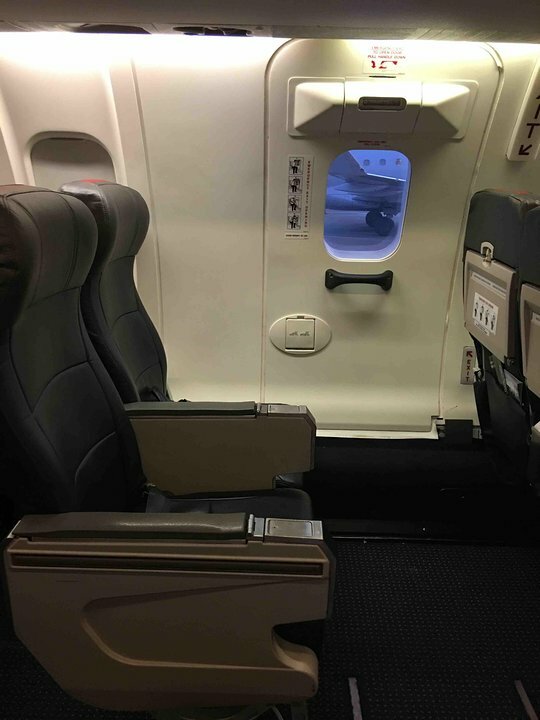 It is the worst seat I have ever sat in on a flight and this was a very new plane.